UK architects David Ben-Grünberg and Daniel Woolfson have updated their shape-shifting D*Haus to create a residence with a rotating roof for a site in Devon, England. The D*Haus Company founders see the residence as the next generation of its Dynamic D*Haus, which was first unveiled in 2012 and was designed to respond to the changing times of the day, seasons and weather conditions. Called Devon House, this new concept with a rotating roof was intended to suit the reduced mobility of their clients in later life. But the estimated £3 million price tag came in well above the their £2 million budget, so Ben-Grünberg and Woolfson were forced to make some alterations to the design. The architects created a cheaper, static version of the same design, which received planning permission in April this year. 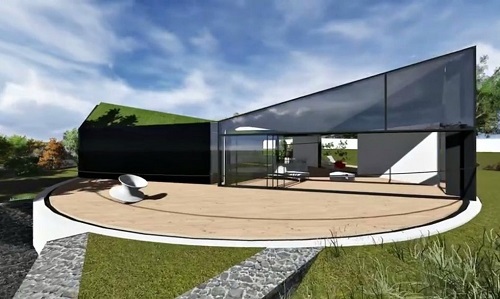 These visuals show the present design, while the video details the duo’s initial concept for the house with a moving roof. They remodelled their 2012 design to include a glazed prism-shaped volume elevated on a rotating circular platform to make the most of the 270-degree views available on the sloped site. Conceived for the harsh, climatic extremes from ‘Lapland to Cape Horn and Aleutians to Auckland’ D*Dynamic can respond dynamically to its environment by controlled adaptation to seasonal, meteorological and astronomical conditions.